“As a nation, we should be asking why is it that our answer (to gun violence) is to go get more guns in the school,” a parent opposed to the plan argued. In a quiet Kansas City suburb, the local school district is preparing for disaster. 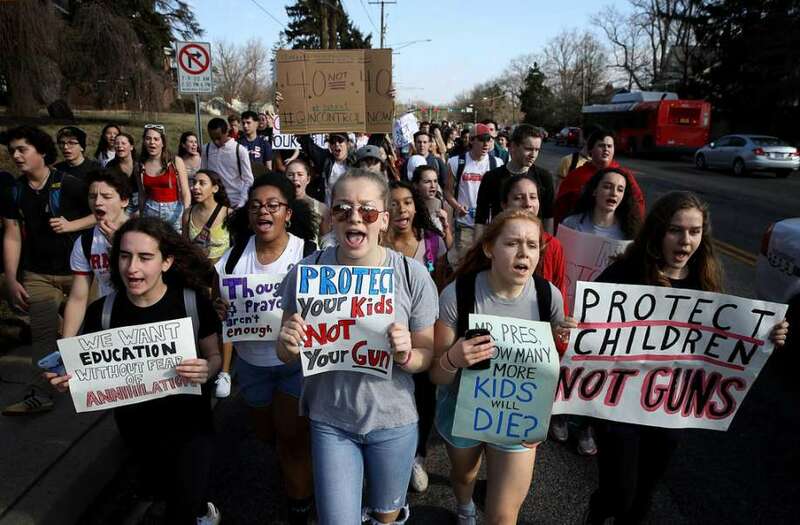 With fear swirling in the U.S. surrounding mass shootings – especially those targeting young people in schools – officials decided to take preemptive action. In an effort to ward off any future mass-shooting threats, the Shawnee Mission School District ponied up funds and purchased a small arsenal of semi-automatic rifles to be used by campus police officers. When word of the purchase got out, it spurred a range of reactions from the community on both sides of the issue. Some parents were unnerved by the news and have begun speaking out against the presence of such weapons on a school campus. Others are claiming that the purchase was not only prudent, but necessary. Supporters also point out that assault weapons are particularly useful in certain situations, such as returning fire at long range. Many school hallways extend longer than 25 yards, the distance that even the most trained handgun users expect a sharp decline in their accuracy. Without the right tools to combat a heavily armed shooter, they argue, school police would be at a dangerous disadvantage. 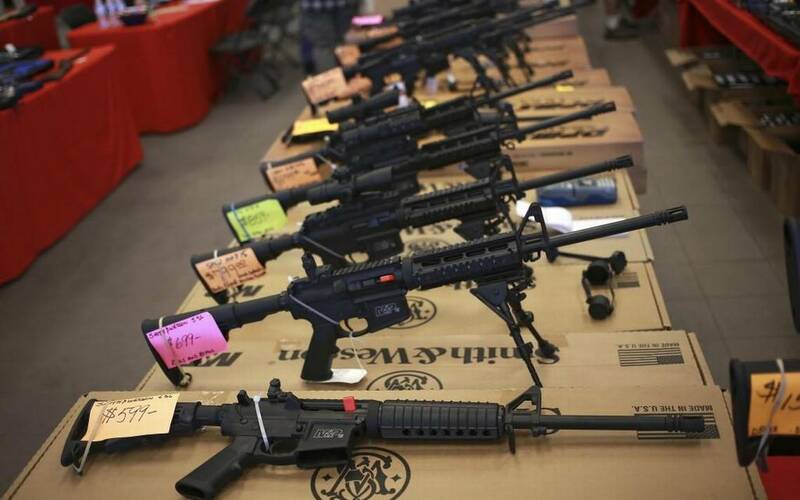 Some of the most high-profile mass shootings, such as the Sandy Hook massacre, have involved assault weapons. However, many others have not. The shooter who killed 32 people at Virginia Tech University used only handguns. But the move to purchase semi-automatic weapons has also been heavily criticized. Other parents thought the price tag ($5,671.04) was excessive, and argue that the money would have been better spent on raising teacher salaries or buying badly-needed classroom materials. “It’s pretty offensive to me as a taxpayer to feel like you don’t have any voice and you are being excluded from decisions that could harm your child or kill them,” said Melissa Patt, a mother of three Shawnee students. “As a nation, we should be asking why is it that our answer (to gun violence) is to go get more guns in the school,” she said. Will More Guns Solve the Problem? That’s the real question, right? Gun advocates point to cases where a “good guy with a gun” was able to stop a “bad guy with a gun.” Just yesterday, the shooter at a baseball diamond in Alexandria was taken down by an armed security detail before he could kill anyone – a story which will no doubt fuel their argument. However, there are also instances where the opposite is true, where more guns only make a situation chaotic and result in increased bloodshed. Perhaps just as important, though, is the issue of firearms in schools. While assault rifles could help prevent a mass shooting from occurring, their presence may also have unforeseen consequences. The new policy risks creating a culture of fear and reliance on heavy guns for safety, which would be antithetical to learning. Where do you stand? Was the school district right to take “high-powered” precautions? Texas Church Massacre: Are Prayers Enough? 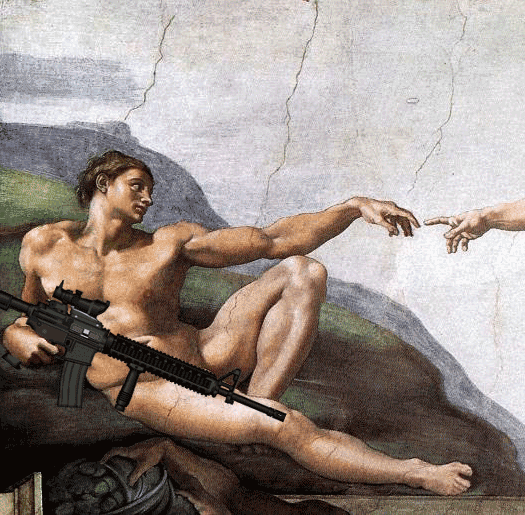 Is Gun Ownership a God-Given Right? Tom, how can a buzzer and ID cards stop a crazy person with a gun? Oh a bottom to call police, do you realize how many children can be killed by the time police even arrive? Only a good guy with a gun can stop a bad guy with a gun. A firearm is only a tool, when you outlaw the peoples right of self defense only the bad guys will be armed. And if they don’t have access to guns they can use other tools like bombs, cars… oh… and even car bombs. Even a sharpened pencils can make a great weapon, let’s ban those too. Most schools have buzzers, IDs, etc. But nut jobs still get in because they KNOW nobody in the school is armed and they’ll have free reign to kill as many people as possible. Once that nut job knows that there are armed and trained security personnel in the school, they will stay away. thats how we do it in canada. yes. our gun control is very tight, which is offensive to some, uncomprehendable to others. but like taking a step back in time.. with [most of us] not having a gun, never mind the need for.. lol. the buzzer with camera at the door IS a deterrent..
“However, there are also instances where the opposite is true, where more guns only make a situation chaotic and result in increased bloodshed.” That’s an unsubstantiated assertion as well as an obtuse statement. I can’t think of any occurrence where the “good guys” having more guns creates anything but a win for what’s right. Obviously these folks have never been involved in a gun fight. I have and I’m glad we had *more guns*. Well said, William. I am becoming increasingly disappointed in the ULC for participating in this type of sensationalist, click-bait “journalism”. I do like your post, and I totally agree it is not guns that kill people it is people that kill people. This is a very bad idea. If someone comes into a school and starts shooting at the children and an armed security guard has an AK47 and starts shooting back, how many kids are going to be right in the way and will be shot by the guard? This is serious. 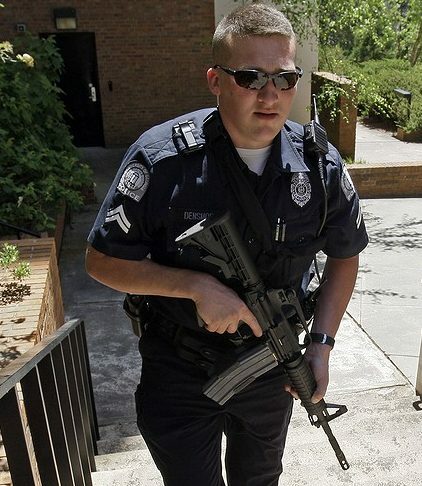 Most security guards are not trained in the use of automatic rifles, etc. They are more likely to kill the innocent bystanders than not. In the case of a school shooting incident, the kids are going to panic and be running around trying to get to safety. Even highly skilled sharpshooters would have a difficult time hitting the perpetrator without accidentally hitting one of the children. The school administration should return the guns to the store and get their money back. There are better ways to protect the children. Active shooter police training has evolved from “surround and wait to negotiate” to “enter and engage and neutralize the shooter as necessary”. Sometimes it takes a rifle to do this. You call these responders “security guards”. 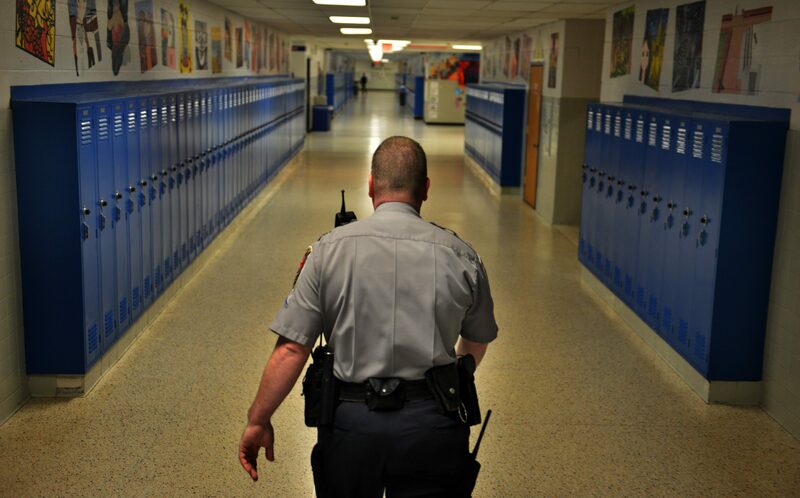 Some school districts employ guards to roam parking lots, but the vast majority of them have school resource officers, either employed by the district or the local PD. They are highly trained, and motivated to do what it takes to keep their charges safe. How do I know all this, you may ask. I’m a 30 year law enforcement veteran, a Master Texas Peace Officer who has worked investigations and narcotics, and am currently employed as a college campus police officer. I have a rifle in my patrol car and one in the safe in my office. And I’m glad to have them! And we, good sir, are glad to have you and others like you out there protecting us. Thank you. Your just plain silly. There no automatic weapons, as they are useless. There are better ways to protect kids, Mmmmm, such as ? Maybe you could visit law protection shooting competetions. They can hit a playing card at 1,000 yards. The only thing that will stop a bad guy with a gun is a good guy with a gun. Case in point, who would you call if some one was breaking into your home, 911 or your minister ? First of all fully automatic rifles are illegal in the United States. These are semi-automatic rifles that are shot once each time the trigger is pulled. Although I agree if they are being put in the hands of these guards they should be fully trained to know when and where to use them. Fully automatic guns (rifles/pistols) are not illegal in the USA, I believe they are just not made or imported much anymore so the price has become very high (The $5,671.04 mentioned above would not be enough to buy even 1/2 of a full auto gun), plus you must pay a $200.00 Tax and wait up to a year or more to get you License/permit to own it, that is after having passed a FBI background test, get fingerprinted etc. I find it pretty funny when people say that it should be the cops you call and never to rely on having a gun to protect yourself, most of the people they like to call “Gun Nuts” because we/they would carry a gun for self defense, use and practice with a gun much much more then most police officers, unless that cop also happens to be a “Gun Nut”. A lot of the “Gun Nuts” shoot every week, 50 to 500 shots per week, do you know how many times a year most cops shoot, once a year to qualify to be able to carry their service gun. How many stories do we hear each year about the cop/s that shot all 17 rounds from their Glock and missed the badguy with every shot? A lot more I could say but it is getting late, it is time to take my dog out for a walk then make dinner and go to bed. You are, of course, a highly trained and experienced, tactical expert. Or perhaps just another armchair quarterback. Their not AK47’s or automatic rifles. First of all, security and law enforcement officers do not use AK 47 type weapons. The Offers who do have high capacity round rifles go through intensive training, not only to be proficient, but to know when and when not to use that weapon (same as their handgun). They do not use “Automatic” mode on the rifle as you suggest. You make it sound like the officer is going to just start spraying bullet everywhere. I respect your opinion and your position, Being a retired law enforcement officer and a seasoned combat veteran, I can tell you that your description is inaccurate. I understand your concern and appreciate you position. Kalashnikov AK 47 and variants are currently banned from import in the United States per president Obama presidential order. I see no problem with this if the people with access to the firearms have the proper training. The possibility of an inglorious death will stop many of those that want fame from being a mass killer. I am also a strong proponent of a law that prevents the news media from mentioning the name, or showing a picture, of someone to attempts (whether successful or not) an act of terror. Remove the fame, and you remove much of the motivation. They have learned from tragedy and chose to offer students real safety. It’s only bad for anyone that wants to kill their students. Most people that oppose guns did not grow up around them. While our Constitution protects our right to bear arms and protect ourselves it did not come with any guarantees that the criminals that use guns on innocent people would cease and desist. If my children were students at this school and I was confident that those with access to the guns were trained and stood ready to defend my children I would have no problem with the purchase of the guns or the school. The safety and lives of my children supersedes any liberal reassignment of my gun rights to the government or otherwise. As a graduate of one of the Shawnee Mission high schools and as someone who grew up there I can say that “these people” live in an expensive suburban area, a high-end community that wants only the best for their children, and wants them to be safe and have good schools. A large percentage of people in this area live in expensive homes, many in gated communities, and of course the more you have the more you have to lose, and lots of “these people” live in fear of change, in fear of outsiders, and in fear of strangers and so most have home security systems and a lot of them are well armed. I’m not saying this is good or bad, but having weapons nearby is just the way it is in wealthy, in urban and in rural America. Personally I don’t think more guns makes things any safer as a rule, unless you’re isolated or in a war zone or some place similar. But if nothing else, just knowing that there is a well-armed response force ready for action would very likely deter anybody from attempting a mass shooting at these schools. I do not think having campus officers parading around the school grounds with military style weapons in any way is conducive to a stable, positive learning environment. So it would be best if the heavy weaponry is not in the children’s view all the time. You are speaking about something that you do not have all of the information about. 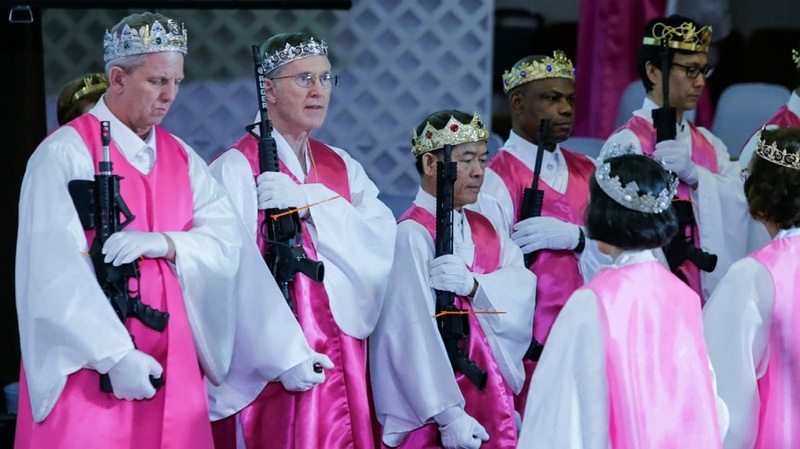 I respect your opinion but first of all….they are not using “Assault Rifles”. They are rifles that can be used in the correct situation(s) to give the Officer a better opportunity to protect lives and possible end the threat. Second, you ask that if a 6-7th grader brings a gun to school is the officer going to run and grab the rifle and kill the shooter kid. That is just crazy!! Officers are trained in “Active Shooter” situations and there is a difference between a kid that is going to shoot a bully and a person who walks into the school with the intent to shoot and kill as many people as they can. 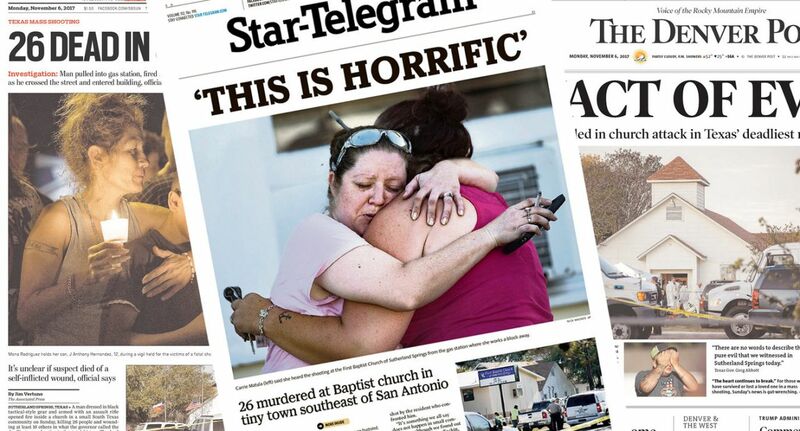 A lot of people are terrified of firearms and that is their right. Firearms are TOOLS only (people murder others with hammers and knives, but nobody is wanting them outlawed) and used for a specific purpose (Good or bad). I am retired law enforcement and a seasoned combat veteran and These type of weapons (TOOLS) can be very useful in the right situation. Anyone know if these folks are commissioned (sworn) law enforcement officers? Or school district employees in uniform? The article states that they are Campus Police Officers. A pistol or rifle is better than nothing in a crisis.Police are sometimes slow to respond.The people using these weapons must be properly trained. WHAT is the probloem! This will protect the students from pathetic liberal mass murderers. They should even give guns to ALL teachers so they may protect their students! I PROUDLY SUPPORT guns and if Obama wants to take my guns he can pry them from my COLD DEAD HANDS! Proper training = proper use of the weapon. There is NO SUCH THING as an assault rifle. It is a rifle. The Assault terminology IS a media invention. However, the quick and easy access for many states to these sort of weapons is the problem. Where I live, long guns are not rigidly controlled, unless they can be modified to go to a full auto mode, or have been modified in one of a number of other ways. However, don’t try bringing your pistol in. You will get turned back and told you are not welcome for at least another 5 years. Exposure to weapons and training in their safe handling is the answer, not making it so people live in fear. I’m all for protection for out kids. Arm the teachers. They are not “Assault” weapons more than any other firearm. All offensive weapons are designed to “assault”. Please stop using that term, which invokes negative connotations, and was a very deliberate anti-gun reassignment of the Eugene Stoner AR-15. “AR” reflected the original manufacturer Armalite, and the class of weapon (rifle). AR has always referred to Armalite Rifle – never Assault Rifle. No amount of passive restraint (metal detectors, laws, ID cards) will deter a purposeful aggressor, and having a $5,000 insurance policy against the possible is no more ludicrous than an individual having insurance to protect the investment in a vehicle. One doesn’t have insurance in the hopes of ever claiming a loss, but one can feel comfort knowing that the fragile aspects of their responsibilities are covered. As a society, we are historically reactive in addressing situations. It’s nice to know there are proactive minds in at least one school district. The news just broke a story 15 minutes ago of an active shooter in YOUR child’s school. Would you feel more comfort knowing that the properly trained School Resources Officer has barely adequate tools for what is unfolding or a comprehensive tool chest? 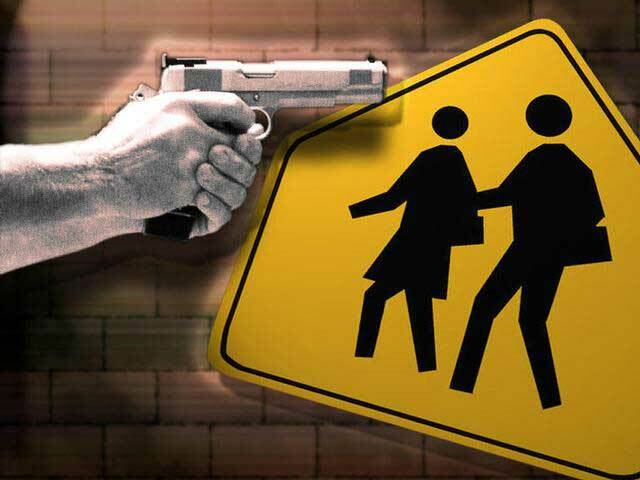 A criminal should not be allowed to walk into a school with a gun or bomb where the school does not have the means to protect those who they have responsibility to educate and protect. You mean like illegal drugs? Cuban cigars? Restrictions don’t keep criminals from getting what they want. It only keeps law abiding people from getting them, and keeps jails full. How many guns are on the streets in Detroit? New York City? They’re impossible for law abiding people to get, but they’re all over the place nonetheless. Howdy. Firstly, semi automatic means self loading or ready to fire again. I feel money buying weapons for schools could be better spent increasing the security of school grounds from people who shouldn’t be there. The crazy people attempting to kill children or infiltrate schools should be met head on at the front gate or any other access point by security staff allowing plenty of warning for shut down internally while authorities are notified to defuse the situation. When seconds count, police are only minutes away! Hi Jeff you are right, if used in a proper way they can be very helpful. My concern other then the bully/bullied, the children running through the hallways in a panic and getting shot with by guards or the crazy that opens fire on the school. I just worry about the kids is all. And I suppose they may have drills on what to do if the sitution occurs and hopefully the teachers know what to do( lock doors secure kids safety). Anyway it is sad sad sad to think the world has come to this. The thing I do is pray pray pray. Thank you for shedding a different light omit!! I can tell you that there are a lot of drills that take place in schools these days so that teachers and students know what to do in the event of an active shooter situation (I have participated in drills and have responded to active shooter incidents). I understand your concern for the students and I feel your concern as I have children myself. It is a sad state that we have to be worried about our children being shot in a school, but the reality is that we live in a time of great evil and we have to be prepared to defend our children, family and ourselves against the evil that people do. I agree that we must continue to pray for their safety, but we must also be prepared to protect our children as well. Have a great day. First, it’d be real nice if people stopped labeling things as “assault rifles,” in attempts to scare people. One misconception is that these “assault rifles” are fully auto, which they’re not. 1 trigger pull, 1 bullet. Full auto, is generally what the military uses, and would empty a full clip of 30 in seconds. BTW, notice how the mass shootings occur in “gun free zones.” The criminals KNOW that people most likely won’t be able to fight back. Even the CO shooter bypassed a theater that was closer, because it was close to a police station. And if schools did like in the 1940s – 60s, and had various shooting clubs, do you think criminals would attack them? The only reason it’d cause fear is because of fear mongers, like the author. Back in the day, gun clubs were common, because people were taught to respect them, and be responsible: http://clashdaily.com/2012/12/back-in-the-1950s-and-even-later-many-high-schools-had-shooting-ranges-students-even-brought-their-own-rifles-to-school-what-changed-in-society-that-we-could-trust-such-activities-then-but-not-now/ No fear of what you know. Thank you God, for keeping some reasonable people, who heed your warnings about protection of our men, women, and children, from terrorists of all sorts. Foot trafficked, or otherwise. There seems to be major issues in parenting, in the raising in homes, to harm others, and not care. Amen. Please learn the ACTUAL definition of assault rifle. PLEASE. Epilogue: On the way to work today (the date is visible here) I listened to NPR (of all the unlikely sources) DEBUNK the number of school shootings the federal government had stated. It was like ten percent of what the original statement was.